This was posted on August 1, 2005 by Teri Maxwell. Children and chores. I wonder if there is any more difficult area of raising children to tackle than this one. In the chore survey we sent out with the June Corners, we gathered a huge quantity of information about chores. In a nutshell, from the questions we asked, here is a summary. Most moms weren’t prepared, while growing up, to be homemakers. Consequently, they have struggled–some greatly–with taking care of their families and homes. A handful of the respondents were prepared. Those who were prepared attribute it to having to do chores when they were children. Every one of the over 250 survey respondents believed that chores were beneficial for the children and the family. The list of reasons why chores are good was long and varied. Some of the benefits were current for the child, the family, and the home. Many of the benefits would be realized and enjoyed throughout the adult years of the child’s life. From the survey, the biggest difficulty with chores was first working with children–having to remind them, their negative attitudes, and their poor work. The second major problem was Mom’s lack of consistency–in developing a chore plan, in scheduling time for chores, in checking the work that was done, and in giving consequences for a bad job and rewards for good work. The chore poll confirmed what we already knew: that chores are important in our children’s lives, and chores need to be made a priority in our homes. In our culture, with its “let children be children” philosophy, it is easy to believe we are doing our children a disservice by expecting them to have responsibility as they are growing up. In reality, the opposite is true. If we choose not to give our children chores and teach them to accomplish them well, we are handicapping our children for their futures as adults. There are a multitude of long-term benefits our children will realize from the disciplines and skills they will develop as a result of chore responsibilities. At one point, Steve and I realized our struggles with many unsuccessful years of chores had come because we wanted our children to be responsible for their chores, but we hadn’t made it the priority it needed to be to ensure that it happened. As is so often true of anything good we want to accomplish in our children’s lives, it comes back to Mom. If I don’t have an accepting attitude toward my work, the children won’t toward theirs. If I don’t assign the children chores, they won’t do any. If I don’t schedule a time for them to do chores, they will forget all day. If I don’t check their work, they will do it sloppily, if at all. If I don’t give consequences, they won’t be motivated to improve their chore performance. To be honest, I would like it if so much didn’t depend on me. At the same time, I know the Lord uses all of this not only in my children’s lives, but also in my life. I am told in Galatians 6:9, “And let us not be weary in well doing: for in due season we shall reap, if we faint not.” Even if this part of motherhood is difficult, I am not to give up. I am not to grow weary. I have to admit I have wanted to give up–more than once! I can remember telling Steve that perhaps I could let the children grow up but keep their bedroom doors closed and never go in. I would ignore the fact that they weren’t doing what they had been assigned to do in their rooms. Eventually they would be adults. It would no longer be my responsibility as to whether they picked up their bedrooms or didn’t. Even while speaking those words, I knew this was not an option the Lord was putting before me. He had told me in Titus 2:4 to love my children. Part of loving them was the necessity of teaching them to be responsible. 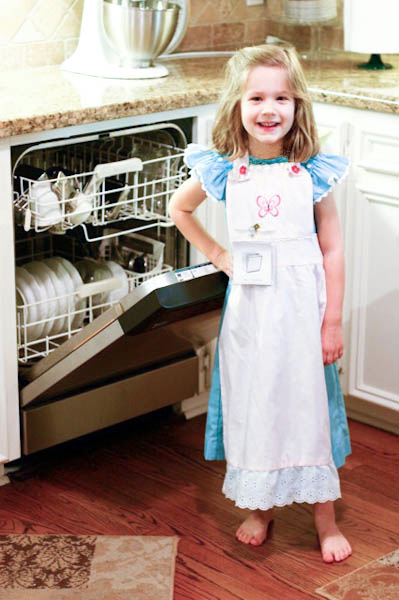 This area of children and chores is vitally important. As we have studied chores and their impact on children’s lives and then on them as adults, we have come to see that chores are as critical as homeschooling is. It is as essential a part of their education as their book work. Being aware of the benefits of chores is a major part of the necessary motivation to make the daily decisions that will foster chore success. My encouragement to you is to make chores a priority for your children. Consider chores as much a part of your child’s education as his math book is. When you view chores in this light, you will be motivated to invest the time and energy needed to be successful with chores. After all, it does mostly fall back on us moms. Will we women, who seek the best for our children, hold them responsible to do their chores? We now have available a book with a ChorePack Kit all about chores and helping you make your chore system: Managers of Their Chores: A Practical Guide to Children's Chores.